Gloves can add just the right finishing touch to your bridal ensemble, special occasions, pageant and proms. They look fabulous with any gown. The gloves have just a touch of spandex to give them a perfect and comfortable fit to any size hand. These bridal gloves are brand new and sealed in packaging. These gloves measure 23" (58cm) long. These are the longest gloves. These bridal gloves rise approximately 5" above the elbow. These gloves have a smooth and silky finish which gives it an elegant look and is a lovely complement to any bridal dress fabric. 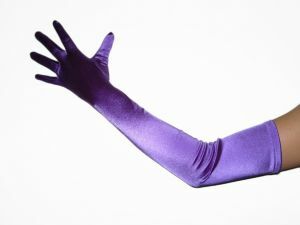 I love my purple gloves....they are perfect fit and much cheaper compare to other site of bridal boutiques...don't don't elsewhere girls...just click the button to buy it.....you won't regret it..!! This is the best gloves ever...the price is unbelievable cheap....probably the cheapest in the US....and the quality is even better than Dav's Bridal or any other Bridal stores....the shipping is also lightening fast...I placed the order on Monday and received my gloves on Wednesday....I don't know what to say...I guess I can only say, "Thank-you very much - PiggyTiggy" ! !